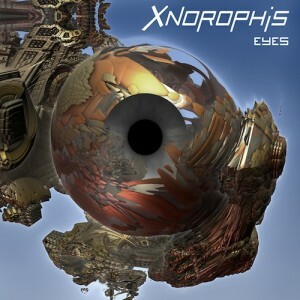 Xnorophis offers an organic edge to electronic music, bringing in acoustic elements, world sounds and ecliptic vocals to the mix. This release, Eyes, offers a tribal psytrance flavour with plenty of tam-tam rhythms mixed with techno beats, electro, ambient synths, and hypnotic vocals. Xnorophis is created by Scottish producer Martin Bennett, who now resides in Montreal, Canada. He enjoys working with guest artists, locally and from all parts of the globe, to spice up the sound. Mastering by Studio Loco, Montréal, Canada. Artwork by Tom Hamlyn. MP3 Download | FLAC Download | WAV Download · Download count: 11,746. The strength of this album lies in the catchy rhythms mixed with melodies of magical sounds. Good job. The concept is interesting, and the background “tribal” beat is well-developed. Unfortunately, most of the album sounds the same. Once you get past the first track, the tribal beat remains… similar until it becomes almost redundant. Martin has a great idea here, and the production is sharp and engaging, but unless you are a huge fan of the catchy, repetitive tropical beat, you will ask yourself why everything sounds the same. No doubt this is a good collection, and the result of hard work. what a great piece of work from the heart. thank you very much. Reminds me sometimes the good old SSO Times or maybe Etnoscope ? Take a seat inside an intergalactic time machine and get ready to be taken back in time in this percussion driven tribal elemental. Starting with a very minimal tone, the simplistic hand-crafted loops are placed neatly together side by side to form an African-like soundscape. Interesting enough, the composition takes place in Canada, yet nothing in this piece reminds me of Canadian styles. As neat as all this may sound, the minimal style in the beginning is, well, very minimal. The first six songs progress with small percussion and bass loops switching off and on rather than melody, layering synths, or pads carrying layers to create a musical body. The first half of the album should be left out, in my opinion, because each song is more of a backbone to a bigger, broader idea. There is no meat to them, no intricacy, no unexpected visions, and they just are not all that interesting. There is a lot of room left to grow and a lot more expected. Don’t let that fool you from giving this album a try, however. At track 7, Violet Tower gives us that body we have been craving. Vocals are added, pads begin to carry the vision further into broader horizons, and arping melodies similar to the Goa roots of Psytrance are brought forth to put together a final frontier of passion the artist begs to express. A true tribal experience, however, should let me close my eyes and imagine an organic landscape full of sun and open fields. I want to imagine wonderfully painted patterns on the faces of distant cultures, people dancing around large bon fires as the smoke climbs towards the white dotted sky, the moon screaming a blanket of twinkling blue light into the hearts of the earth, and I want it to sound amazing. This album doesn’t do that, but the last few tracks certainly get closer to that accomplishment of pure tribal engulfment. The tracks Violet Tower, Oblong Roads, Ganga Sparkle, and Torpedo are the definitions of this album. They combine the ideas and techniques from every other track and turn a small idea in a better experience. The tippety tappety of the small drums, the Goa bass line, the progressive style, the hint of vocals, and an additional trance melody with more layers of instruments make these tracks great. I think if you were to simply take out everything else and leave these in, it would make the album better. Quality over quantity my friend. My advice would be to take a look at these creations and form your future projects based on what you have learned from them. Try to examine different drum lines, instrument programming, and tribal atmospheres to take advantage of our minds and run them through an organic soundscape. Right now, a large portion of the album is generic. Focus on expansiveness, yearning to create a land that only you know into pure sound where we can escape and relax. Keep it up man!! If you want some inspiration, listen to the Steve Roach album “Strata”. The first few tracks are largely tribal ambient bases, taking your percussion inspirations you love and adding astounding atmospheric explosions of euphoria. I can see you taking a faster pace than this without the ambient style, adding intricacy to your work. A brilliant piece of work. Less is more and you have done that beautifully in the marriage of tribal overtones against a progressive trance bassline. Refreshing ear candy! Fantastic ethno-prog! All fans of world percussion must have! Fantastique!!!! les percussions et la techno se marient tellement bien… merci! its a beautiful story based on a constant bass level!! amazing! Самый охуенный релиз на тему трибальных драмов , и вообще какое то перкуссионное безумие в хорошем смысле этого слова. Если сравнивать с Hakka, то они больше шаманские фигляры и экспериментаторы , в случае с Xnorophis – это сафари белых колонизаторов – бескомпромиссное, настойчивое и достигающее своей цели.